There is a very good fight card coming up the end of the month, which will feature a double main event. The fights take place at the Fabulous Forum in Inglewood, CA. and both of these bouts are scheduled for 12 rounds. Two titles will be on the line, the first of which is the vacant WBA World welterweight title. Fan favorite and hard-hitting Lucas “La Maquina” Matthysse (38-4, 35 KOs) will be in the ring against the undefeated Tewa Kiram (38-0, 28 KOs). 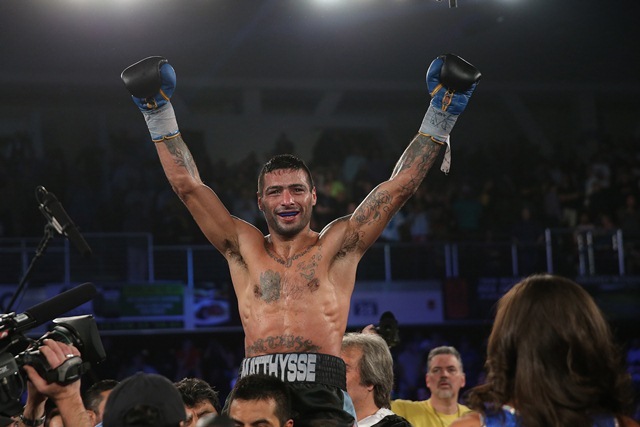 Matthysse has been involved in many barn burner fights and is always guaranteed to put on a show. He did lose to the hard-hitting Viktor Postol and was out of action for a year-and-a-half. He came back strong last year against Emmanuel Taylor, knocking him down twice, the second time resulting in a knockout victory in the fifth round. Kiram has not fought here in the States and for that reason is a bit of an unknown to many fight fans. He has however, traveled over here in 2011 and 2013 with Manny Pacquiao as a sparring partner. Ten years Lucas’ junior, Tewa does carry with him that unbeaten record, and as much of an unknown he is, this could prove to be a very interesting fight. He is also ranked number one by the WBA in his weight class, while Lucas is number three, so that is another fascinating little fact to pay attention to. The second fight in this double main event is one for the WBA World lightweight title. The men involved will be Jorge “El Nino de Oro” Linares (43-3, 27 KOs) going up against Mercito “No Mercy” Gesta (31-1-2, 17 KOs). The always tough Linares has also been matched up in some very good fights, and his last loss came almost six years ago. He is the current holder of the WBA lightweight belt, and is a four-time world champion. His fights are never dull regardless of his opponent, and this one should be no exception. Standing in his way is the Filipino southpaw Gesta. Undoubtedly a good fighter, the question remains as to whether or not he has the power and talent to grab the belt from Jorge. Trainer Freddie Roach certainly thinks so, but time will tell. The fight is scheduled for 10 rounds in the super lightweight division. As with Tewa, Arnett is 10 years younger than Kamegai, but that will probably make no difference. The skill that the talented Yoshihiro possesses should be enough to overcome anything that Daquan throws at him, but should also provide Arnett with some education. As with the other two fights, the element of surprise is always there, and fight fans should be pleased with what these bouts deliver to them. The fights take place Saturday, January 27, and will be televised on HBO beginning at 10:30 ET.